Spearmint, Mentha spicata (sometimes referred to as M. viridis and M. crispa), is a Mediterranean native known from ancient times as an herb of hospitality. In the symbolism of plants, spearmint conveys wisdom. 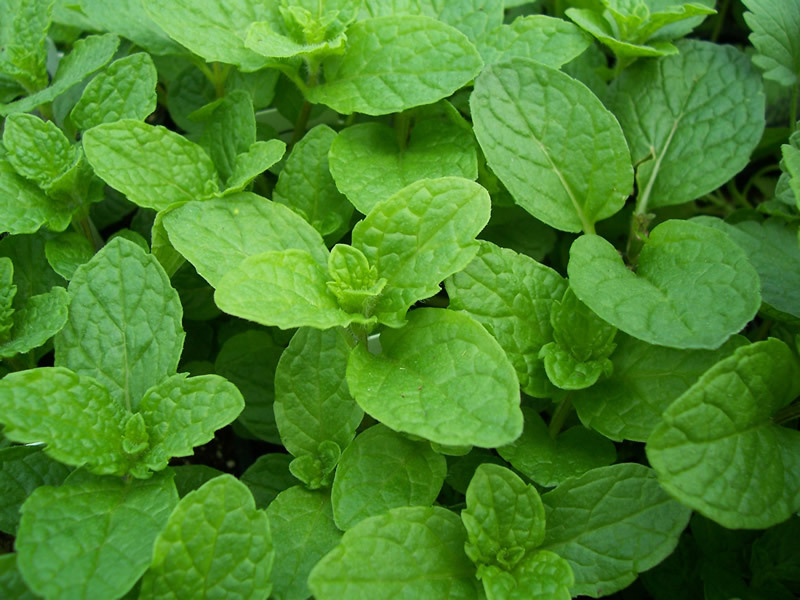 Common names for this aromatic herb include garden mint, lamb’s mint, Our Lady’s mint, spire mint, and sage of Bethlehem. The Romans brought mints to Britain, and English colonists brought spearmint and other mints to their settlements in North America. Spearmint is one of at least thirty species in the extensive Lamiaceae, or mint, family. Only the members of the Mentha genus, however, are considered “true mints.” Mints interbreed quite easily. There are hundreds of hybrids and varieties in this sprawling genus of aromatic herbs, and many have naturalized throughout North America. A mint used in Chinese medicine is M. arvensis, commonly known as field mint or wild mint. The name in China for this highly variable species is bo he. This lilac-blossomed herb is used as a cooling remedy in the treatment of influenza , sore throat, inflammations of the eyes, and head colds. M. arvensis is widely prescribed by Chinese herbalists as a carminative (medication given to expel gas from the digestive tract) and stomachic (medication given to improve digestive functions). It is also effective in relieving some types of headache. In general, field mint is said to be helpful in stimulating movement of the qi or life energy that may become stagnated in the liver. Some herbalists categorize M. arvensis and M. canadensis as wild mint, a native American species. The species M. arvensis var. piperescens is known as Japanese mint. It is widely cultivated as a primary commercial source of menthol. Mints are hardy perennials which spread by underground runners. They may become troublesome weeds in the garden if not tended and controlled. Mints thrive in semi-shade and rich, moist soil. All mints have a square stem with simple leaves growing in opposite pairs. Spearmint leaves are about two inches long, bright green, oblong or lance-shaped, veined and somewhat wrinkled with unevenly toothed margins. The upper leaves are sessile, and the lower leaves have a short stalk. The herb is unbranched and grows in thick clumps in moist areas along roadsides, near streams, and in low meadows and pastures where it may reach a height of two to three feet. The flowers form in a cluster in the leaf axils at the tip of the purple or green stem, tapering nearly to a point. One or more flowering stems flank the central spike. Blossoms are a pale to deep violet color and bloom in July and August. The small tubular flowers each have two long and two short stamens. The brown seeds are tiny and round. Spearmint contains volatile oil, the flavonoid thymonin, caffeic acid derivatives, rosmaric acid, carvone, and limonene. Spearmint’s distinctive, pungent aroma is attributed to the primary constituent of the volatile oil, the chemical carvone. According to the United States Department of Agriculture (USDA), spearmint is regarded as an invasive weed only in Tennessee and other parts of the South. In the northern Plains states and parts of the Midwest, however, spearmint is raised as a cash crop; it is presently on the list of the 50 top cash crops in the United States. Researchers in Montana are studying spearmint, hoping to discover why it resists a plant disease known as verticillium wilt when peppermint is not resistant. Like most medicinal herbs, the mints have found a place in ancient myth and legend. The generic name Mentha is derived from the story of the goddess Persephone, who was jealous of Pluto’s love for the nymph Minthe, and transformed her rival into a common garden plant. The god Pluto, unable to retrieve the lovely Minthe, assured that her fragrance would waft on the garden breezes, releasing more of the pleasant aroma each time it was trod upon. In the first century A.D., the naturalist Pliny suggested that students wrap a braid of mint around their heads to bring delight to the soul, thus benefiting the mind and enhancing their scholarship. Aristotle forbade mints to be used by soldiers prior to battle because he believed that the qualities of this herb might diminish their willingness to fight. The smell of “Spere Mynte,” according to the herbalist John Gerard writing in 1568, “rejoiceth the heart of man.” Mints were commonly used as strewing herbs, both for their fragrance and because they repel mice. Sprigs of fresh mint were also put in grain storage sacks to repel rodents. The steam vapor of infused mint was used to freshen the air in a sickroom. Mints were also used to scent bath water and to “strengthen the nerves and sinews,” according to the herbalist Parkinson. Mints were used to whiten the teeth and in a wash to ease irritation of chapped hands. In the Middle Ages, when the bites of mad dogs must have been a common complaint, mints, particularly spearmint and peppermint, were among the many herbs recommended to treat the wounds . The mints were mixed with salt and applied directly to the bite. Mints were mentioned in the Bible as herbs the Pharisees used for tithing. Mints were a highly valued medium of exchange in ancient times. 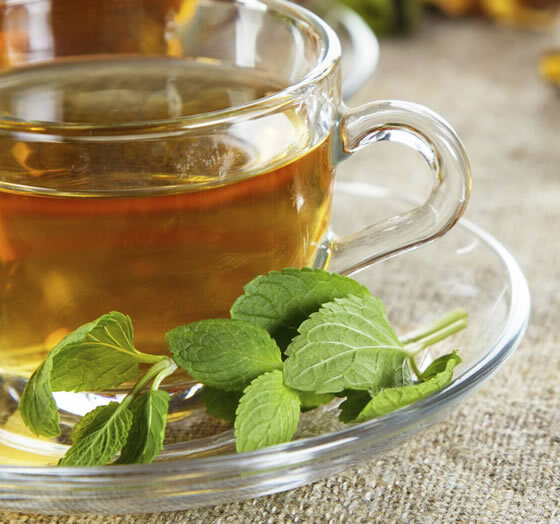 Refreshing mint teas were a popular drink during the time of the American Revolution because they were not taxed by the English; in fact, spearmint was an important cash crop in Connecticut at the time of the Revolution. The aromatic tea also enjoyed popularity during the Civil War, when imported black teas were less available. The various mint species have many common chemical properties and beneficial actions. The fresh or dried leaves and the volatile oil, extracted by steam distillation, are the medicinally useful parts. Spearmint is slightly less medicinally potent than peppermint (M. piperita), a popular and well-known hybrid of spearmint and water mint (M. aquatica). Spearmint is used similarly to peppermint in medicinal preparations. These mints are particularly beneficial in relieving digestive disorders, colic, and flatulence due to their carminative and antispasmodic actions, and may be helpful in the treatment of irritable bowel syndrome. Spearmint may also relieve motion sickness, hiccups, and nausea. The milder spearmint is a safe remedy when prepared as an infusion for children. 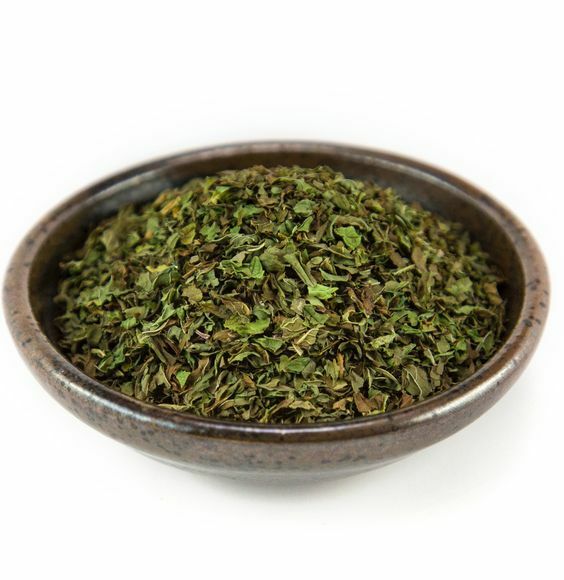 Spearmint is diuretic and has been used to treat cases of suppressed or painful urination. It is high in vitamins A and C, and has been employed both to prevent and cure scurvy, to improve eyesight and reduce night blindness, and to bring a sparkle to dull eyes and a gloss to the hair. A vinegar decoction of spearmint applied as a hair rinse has been used to treat head sores. Spearmint is commonly used in culinary preparations to season meat, fish, and vegetable dishes. Mints are also used to flavor candy, toothpaste, antacid medicines, chewing gum, shaving cream, liqueurs, and even cigarettes. Spearmint is the preferred herb used to prepare the traditional drink of the American South, the mint julep. Recent research indicates that spearmint may have useful antibacterial properties in addition to its traditional uses as a digestive aid. A group of Japanese researchers reported in 2001 that essential oil of spearmint showed significant bactericidal activity against such disease agents as Staphylococcus aureus, Escherichia coli, and Helicobacter pylori. Spearmint is also being studied for its effectiveness in counteracting the damaging effects of oxidation in human and animal tissue. It has already been shown in animal studies to offer some protection against the growth of certain types of tumors. Spearmint should be harvested on a dry day, after the dew has evaporated and before the sun robs the plant of its volatile oil. The plant should just be coming into bloom. Stalks are cut a few inches from the ground, and any insect-damaged or brown leaves should be trimmed from the stem. The stalks should be tied in bundles and hung to dry in a warm, airy room out of direct sunlight. After the herb is crisply dry, the leaves are removed from the stems. The discarded stems may be added to a compost pile. The dried leaf is stored in clearly labeled, tightly sealed dark-glass containers. Infusion: Place 6 tbsp of fresh mint leaves in a warmed glass container. Bring 2.5 cups of fresh, nonchlorinated water to the boiling point, and add it to the herbs. Cover and infuse the tea for about five minutes. Strain and sweeten to taste. Mints may also be infused with warm milk for easing abdominal pain. The prepared tea will store for about two days in the refrigerator in a sealed container. Drink three cups a day. 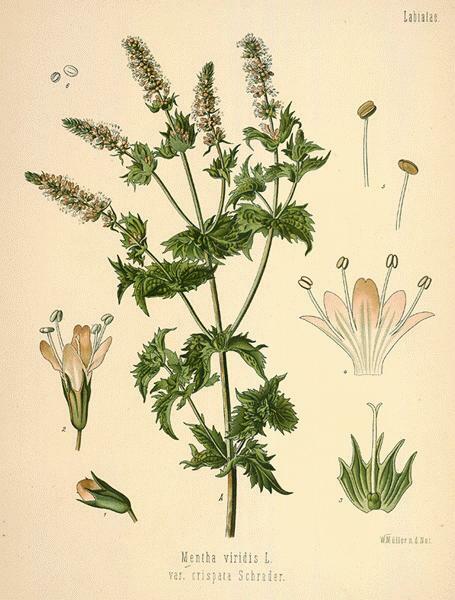 Spearmint combines well with white horehound (Marrubium vulgare) in infusions for feverish children. The infusion of spearmint may also be used as a gargle to soothe the throat and freshen the breath. Tincture: Combine four ounces of finely-cut fresh or powdered dry herb with one pint of brandy, gin, or vodka, in a glass container. The alcohol should be enough to cover the plant parts. Place the mixture away from light for about two weeks, shaking several times each day. Strain and store in a tightly capped, dark glass bottle. A standard dose is 10 to 30 drops of the tincture three times a day. Essential oil: The essential oil is obtained by steam distillation of the fresh, flowering tops of the mint. A few drops on a sugar cube are a safe dosage several times a day. A few drops of oil added to water and applied externally will relieve itching, burns, insect bites, scabies, and other skin irritations. The essential oil may also be diluted with almond or sunflower oil for massage. Spearmint is a mild herb and generally considered safe. Some herbalists counsel against administering mint tea to young children, infants, and pregnant women. People with hiatal hernia or having an acute gallstone attack should not use spearmint. When spearmint is taken internally at normal dose levels, there are no side effects. The plant has, however, been reported to cause an allergic skin rash in some susceptible people. Preparations containing spearmint are believed to interfere with the beneficial action of homeopathic remedies when taken in close proximity. On the other hand, homeopaths in the United States disagree as of 2002 as to whether spearmint can antidote a remedy. Many maintain that if the remedy has been properly selected by the practitioner, there will be no interference from mint-flavored products.